Globoid cell leukodystrophy (GLD), also known as Krabbe disease,is a progressive white matter disorder with autosomal recessive inheritance. A number of clinical types can be distinguished,which differ in age of onset and in the rate of clinical deterioration. The early infantile or classic type is the most common. Its incidence is estimated at 1-2 in 100 000. The other types are: congenital,late-infantile, juvenile, and adolescent-adult. As a rule only one variant of GLD occurs within one family, although exceptions have been reported. Clinical features and course of disease are fairly uniform in early-infantile GLD. During the first few months of life the infants are healthy and their psy-chomotor development is normal. The onset of clinical symptoms occurs between 1 and 6 months of age. Hagberg et al. (1969) distinguish three clinical stages. Stage I is characterized by hyperirritability and periods of crying, particularly when the infants are handled and nursed. They seem to be extremely sensitive to light and noise and often have excessive startle responses. Periods of fever often occur without signs of infection. The muscular tone increases. At the onset of the disease the deep tendon reflexes are normal. There is a stagnation of mental and motor development, soon followed by regression. In sporadic cases convulsions, hemiplegia, or predominant signs of peripheral neuropathy are the presenting abnormalities. Within 2-4 months of onset most patients reach stage II. This stage comprises the subsequent period of rapid and severe motor and mental deterioration. A constant opisthotonus and a hypertonic flexion of the arms and extension of the legs are present. The deep tendon reflexes can no longer be evoked. There are extensor plantar signs. Abilities previously achieved are lost. At the same time the general condition deteriorates, with more frequent hyperpyretic periods, often accompanied by intense sweating. Pulmonary infections are common. Myoclonic irregular jerks of the arms and legs, startle myoclonus, hypertonic fits, and other atypical seizures occur, as do typical, generalized tonic-clonic seizures and infantile spasms. The signs of visual failure and optic atrophy begin to appear. Stage III is the vegetative,burned-out stage. The children seem to have little or no mental activity and lie in a decerebrate posture. They are blind and make no voluntary movements. Touching may elicit primitive generalized reflex movements. The children lack sucking abilities and have to be fed by nasogastric tube. The muscular tone often changes again. The opisthotonic posture disappears and is followed by a tendency to hypotonicity. The children become cachectic, and if they do not die of an intercurrent respiratory infection or of aspiration they succumb gradually. Death occurs between 5 months and 3 years of age. In rare cases, GLD is already manifest during the neonatal period in the form of unspecific feeding difficulties, irritability, twitchiness, or respiratory problems. Both floppy and hypertonic neonatal variants have been described. The later onset forms of GLD are clinically much more heterogeneous and progress more slowly. A subdivision into late-infantile onset (6 months to 3 years), juvenile onset (4-10 years) and adolescent-adult onset has been proposed, but the subdivision is arbitrary. In most children the onset of disease occurs before the age of 5 years; adolescent-adult onset is rare. There is no significant difference in symptomatology according to the age at onset. The initial signs in the late-onset forms of GLD are quite variable: spastic paraparesis, hemiparesis, cerebellar ataxia, isolated visual failure (as a result of either optic atrophy or bilateral involvement of the optic radiations), dystonia, epileptic seizures, psychosis, and mental deterioration. Of these signs, increasing difficulties in walking caused by spasticity or ataxia and isolated visual failure are the most frequent first manifestations. Irritability is not infrequently noted early in the disease. 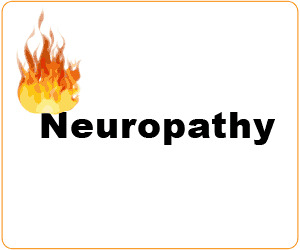 Peripheral neuropathy as an isolated presenting sign of the disease is a rare variant that can occur in late-onset types but has also been reported in infants. The rate of progression and duration of the disease are quite variable. Some patients, and especially those younger than 3 years, have a very rapid course of disease, becoming bedridden, tetraparetic, and demented in less than 3 months. Most patients, especially those with later onset, have a more chronic course. Death occurs after a highly variable period ranging from 18months to more than 14years. Bronchopul-monary infections are the most frequent cause of death. 10 cells/ml, the majority of these being mononuclear leukocytes. The elevated CSF protein level is less constant in later onset forms of GLD, being found in about 50% of the patients. In early-onset GLD, the EEG is normal at the beginning of the disease, sometimes even after some months of manifest clinical symptoms. Abnormal findings tend to appear at the end of stage I. The pattern then becomes increasingly abnormal, characterized by markedly slow activity of high voltage. In the terminal stage the background activity is frequently interrupted by numerous fast, sharp-wave activities, episodic dysrhythmias, or epileptiform episodes. Sometimes a picture of hyps-arrhythmia is found. Nerve conduction velocity is markedly reduced in all patients with early-onset GLD. In later onset forms the reduction in nerve conduction velocity is more variably present; conduction velocity can also be normal. The diagnosis of GLD is established by showing a deficiency of galactocerebroside p-galactosidase (galactocerebrosidase) in white blood cells or cultured fibroblasts. It is not possible to distinguish between early-onset GLD and late-onset variants by comparing residual enzyme activities. There is a considerable overlap between the normal range and the carrier range of enzyme activity, so that carrier testing is often unreliable. In addition, very low levels of galactocerebrosidase activity (less than 10%) have been found in healthy people. The presence of polymorphic amino acid changes in the enzyme causes this wide range of activities. In some families additional studies, such as substrate loading tests in cultured skin fibroblasts, are necessary. DNA analysis may help in solving the problems with diagnosis. GLD can be diagnosed prenatally by assaying the enzyme activity in chorionic villi or amniotic fluid cells. DNA confirmation is an option. Gross examination of the brain reveals a moderate to marked reduction in size. On sectioning, the cortex appears to be relatively spared but there is a marked reduction in the amount of white matter, which shows a brownish discoloration. Microscopic examination confirms that there is little or no involvement of cortical gray matter. The cerebral, cerebellar, and brain stem white matter shows diffuse demyelination throughout the brain, although there are regional variations in intensity. There is a distinct tendency for the U fibers to be preserved. The extent to which tracts in the brain stem and cord are affected varies. Long tracts, in particular the corticospinal and spinocerebellar tracts, and the dorsal columns are usually severely damaged. In the areas of demyelination axonal degeneration is ob served, but axons are relatively preserved in comparison with the degree of myelin loss. There is an early and marked loss of oligodendrocytes through apop-tosis. There is diffuse fibrillary gliosis throughout the white matter with proliferation of astrocytes. In the central nuclei of the brain moderate neuronal loss can be observed, and sometimes intense gliosis. The pathognomonic feature of GLD is the accumulation of globoid cells. These cells are multinucleated giant cells with ballooned cytoplasm containing finely fibrillary to granular material. Their cytoplasm stains eosinophilic in HE, moderately positive in PAS, and negative or faintly positive in Sudan Black preparations. There are also smaller rounded cells with single nuclei and accumulation of identical material in their cytoplasm. These are called epithelioid cells by some, and are included with the globoid cells by others. Globoid cells are present as single cells or, more often, as groups of cells in the affected white matter. They accumulate around blood vessels. They are not only present within the affected white matter, but can also accumulate in central gray matter structures. There is considerable variation in the distribution and number of globoid cells in individual cases, depending on the duration of the disease and the intensity of the histopathological process. They are lower in number in patients with long-standing disease who have burned-out pathology. At an ultrastructural level the globoid cells appear to contain specific straight and twisted tubular-type inclusions. The tubular inclusions are usually dispersed throughout the cytoplasm, and rarely membrane bound. The straight tubules are angular or crystalloid in cross section, while the twisted tubules are rectangular or oval. Sometimes myelin figures and lipid droplets are found in the cytoplasm of globoid cells. Globoid cells stem from phagocytic mesenchymal cells. 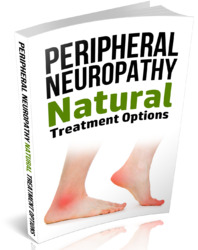 In GLD the peripheral nerves are also involved in the disease process. Light microscopic examination reveals segmental demyelination and variable axonal degeneration in early-onset forms. 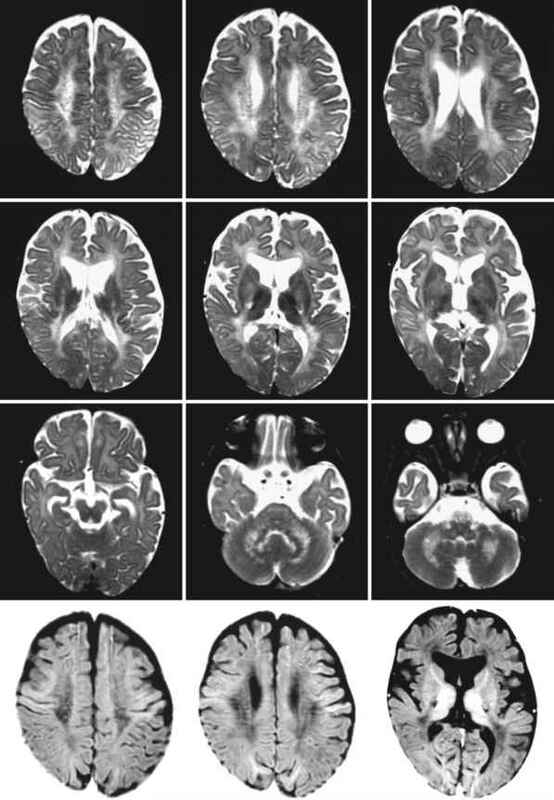 In adult patients, myelin sheaths have been reported to be abnormally thin for the fiber diameter, suggesting hypomyelina-tion rather than demyelination. Usually no typical globoid cells are found. Electron microscopy shows that Schwann cells and endoneurial macrophages contain cytoplasmic inclusions similar to the inclusions in the globoid cells of the CNS. side and sulfatide are greatly decreased, as might be expected from the myelin loss, there is a significant change in the cerebroside-to-sulfatide ratio, from the normal value of 4:1 to as much as 10:1. Proportional to the total loss of myelin there is a decrease in the white matter content of total lipids, cholesterol, gly-colipids, and ethanolamine phosphoglycerides. There is a relative increase (though an absolute decrease) of other phospholipids, such as choline phosphogly-cerides, serine phosphoglycerides, and sphingomyelin. As a rule, no elevation of cholesterol esters is found. Galactosylsphingosine, also called psychosine, accumulates in considerable amounts in the white matter of GLD patients. Concentrations of up to 100 times the normal value have been found. Psychosine is not normally detectable in gray matter, but is elevated in GLD patients, though not nearly to the same extent as in white matter. Analysis of isolated myelin in GLD reveals a relatively normal lipid composition. The cerebroside content of myelin is not elevated. A relatively high concentration of cerebroside is found in globoid cell-enriched fractions from the diseased white matter. There is cerebroside storage in globoid cells, while there is none in the white matter as a whole or in the myelin membrane. The primary defect in GLD is a deficiency of galacto-sylceramidase, also called galactocerebroside p-galactosidase or galactocerebrosidase. This is a lysosomal enzyme that catalyzes the first step of cerebroside (= galactosyl ceramide) degradation and splits cerebroside into galactose and ceramide. Sulfatide is also normally degraded through cerebroside into ce-ramide and galactose. The gene coding for galacto-cerebrosidase, GALC, is localized on chromosome 14q31. Many different mutations in GALC have been identified in GLD. There is no clear genotype-pheno-type correlation. One might anticipate that the difference in phenotypic expression in GLD would result from different levels of residual enzyme activity, but the currently available assay procedures reveal no consistent difference in residual enzyme activity between early- and late-onset forms. Mammalian tissues contain two genetically distinct lysosomal p-galactosidases with different, though overlapping, substrate specificities: galacto-cerebroside p-galactosidase (galactocerebrosidase) and GMi-ganglioside p-galactosidase. It has been demonstrated that under certain assay conditions GM1-ganglioside p-galactosidase can also hydrolyze cerebroside. Psychosine (= galactosyl sphingosine) is hydrolyzed by galactocerebrosidase, but not by GM1-ganglioside p-galactosidase. This difference in sub strate specificity explains why psychosine accumulates to give high levels in GLD brain, whereas cere-broside, while moderately increased in relative concentration, is decreased in absolute concentration. Cerebroside is a constituent almost exclusively of oligodendrocytes, Schwann cells, and myelin sheaths. Metabolism of cerebroside is closely related to the metabolism of myelin. In immature brains, prior to myelination cerebroside is practically absent, and lack of galactocerebrosidase is therefore of little consequence. As soon as myelination begins the normal turnover of myelin starts. This coincides with a rapid rise of galactocerebrosidase activity in normal brain. In GLD brains cerebroside from catabolized myelin cannot be disposed of adequately because of the lack of the enzyme. GM1-ganglioside p-galactosidase may be responsible for part of the cerebroside breakdown and prevent real accumulation of cerebroside. Excess of cerebroside in phagocytic cells leads to the transformation of these cells into globoid cells. In experimental studies the relationship between cerebroside and globoid cells has been confirmed. Intracerebral injection of cerebroside into rat brain elicits a globoid cell reaction, whereas the injection of many other substances does not lead to this response. Psychosine is also a substrate for the deficient enzyme galactocerebrosidase. It is formed from UDP-galactose and sphingosine through the action of UDP-galactose : ceramide galactosyl transferase. It cannot be disposed of in GLD, because it is a very poor substrate for GM1-ganglioside p-galactosidase. Psychosine is a highly cytotoxic substance. There is evidence that accumulated psychosine leads to production of cytokines and inducible nitric oxide syn-thase expression and contributes to apoptosis. It is probable that psychosine generated within oligoden-drocytes during the period of active myelination accumulates until it reaches a toxic level. Apoptosis is selectively induced in oligodendrocytes because psy-chosine formation occurs primarily in these cells. This explains the early and marked loss of oligoden-drocytes, resulting in loss of the myelin sheaths maintained by these cells. In GLD brains the concentration of psychosine correlates well with the severity of pathological changes. When the stage of massive death of oligodendroglial cells is reached, rapid myelin breakdown occurs, contributing more cere-broside,which may enhance the globoid cell reaction. The death of oligodendroglia prevents further myeli-nation. The sequence of events is well illustrated in the Twitcher mutant mouse, which has the same defect as is present in the human disease. Initial myelin development is normal, highlighting the point that myelin build-up is essentially normal in GLD. Subsequently, there is a declining rate of myelination, followed by demyelination and the appearance of globoid cells. It is myelin turnover that brings the enzymatic defect to expression. The difference in tissue reaction between CNS and PNS is difficult to explain. Phagocytic cells in the PNS contain abnormal inclusions similar to those in the brain, and it is not clear why they are not transformed to the typical multinucleated globoid cells. The almost obligatory involvement of the CNS and the variable involvement of the PNS, particularly in later onset forms of GLD, suggests that oligodendrocytes are more vulnerable to psychosine than are Schwann cells. In the brain there is a regional variation in vulnerability to pathologic changes. In particular, the U fibers are typically spared. As the process of myelin build-up is normal in GLD and the defect involves myelin turnover and breakdown, the areas of the brain that myelinate last can be expected to be involved in later stages of the disease than are the early-myelinating areas. The U fibers are the last to myeli-nate,which may explain their relative preservation. In addition, in animal research the in vivo turnover rate of cerebroside appears to be higher in the areas of the white matter that are consistently more severely affected in GLD; this may furnish another part of the explanation for regional variation in white matter involvement. GLD is a primary myelin disorder, and there are no morphological or functional abnormalities outside the nervous system. This is explained by the fact that cerebroside is present almost exclusively in nervous tissue,the amounts in organs outside the nervous system being quantitatively negligible. Although GLD and metachromatic leukodystro-phy are both caused by a genetic defect in the catabo-lism of myelin constituents and initial myelin buildup is normal in both disorders, there are interesting dissimilarities between GLD and metachromatic leukodystrophy. Metachromatic leukodystrophy is characterized by extreme storage of sulfatide, whereas GLD hardly deserves the name 'storage disorder.' In metachromatic leukodystrophy the composition of the myelin membrane is altered, with excessive sulfatide within the myelin sheath. In GLD, myelin is compositionally normal, and the relative rise in cerebroside relative to other lipids in the analysis of whole white matter appears to be related to an excess of cerebroside in globoid cells. It is likely that these differences can be explained by a difference in the rate of oligodendroglial cell death. In GLD these cells disappear rapidly, early on in the local disease process. This early cell death is probably caused by psychosine toxicity. With oligodendroglial cell death myelin membranes are lost simultaneously, before the defect in turnover can trap cerebroside or other abnormal constituents within the myelin sheath. In metachromatic leukodystrophy oligodendroglial cells disappear later, more slowly, and to a lesser degree. Sulfatide is trapped in the myelin membrane and its content increases until the composition of the myelin sheath is so abnormal that the normal stability of the membrane is lost and demyelination ensues. Sphingolipid activator proteins, i.e., saposins A, B, C, and D, are small glycoproteins derived from a common precursor protein, prosaposin. These activator proteins are required for degradation of sphin-golipids. Total deficiency of all saposins and specific deficiencies of saposins B and C are associated with known human diseases. No specific saposin A or D deficiency is known in humans. It has recently been demonstrated that saposin A is indispensable for the degradation of cerebroside by galactocerebrosidase. A transgenic mouse with saposin A deficiency has been shown to develop a demyelinating disease similar to, but milder than, that seen in the Twitcher mouse. Saposin A deficiency can be anticipated among human patients with a late-onset slow-de-myelination disease without galactocerebrosidase deficiency. To date, early-onset GLD has invariably proved fatal. The problem with early-onset forms of GLD is that neuropathological changes are already present in the second trimester of pregnancy and that any form of treatment is applied to an already damaged nervous system. Hematopoietic stem cell transplantation to infantile patients who are already clinically symptomatic has not resulted in beneficial effects. Reports on hematopoietic stem cell transplantation very soon after birth, before the onset of any clinical symptoms, are appearing, and the results are promising but must be confirmed in larger studies. Hematopoietic stem cell transplantation is now performed in increasing numbers of patients with later onset forms. Stabilization and improvement of clinical symptoms and MRI abnormalities have been reported. Early treatment, while the intellect is still intact and the motor disabilities are only mild, is essential. Another therapeutic approach is one of substrate-reduction therapy. L-Cycloserine is an inhibitor of sphingosine synthesis by irreversible inhibition of 3-ketodyhydrosphingosine synthase. Administration of L-cycloserine to animals leads to a reduction in the production of brain cerebroside, sulfatide, and gan-gliosides. Although the level of psychosine has not been measured, it is likely that it is also lowered, since psychosine is made up of sphingosine and galactose. Thus,L-cycloserine lowers the levels of substrates that are not digested in GLD. Twitcher mice treated with L-cycloserine have milder disease and live longer, but only if the treatment is started early. If combined with bone marrow transplantation,L-cycloserine improves the outcome further. The problem with L-cycloserine is that cerebroside and sulfatide are essential for normal myelin structure and function. L-Cycloserine is toxic in higher doses. In addition, L-cycloserine has not yet been tested in humans. Gene therapy also has not yet progressed beyond the animal experimental stage. In cases of early-onset GLD, the CT findings are quite characteristic. The abnormalities seen are related to the stage of the disease. In stage I there are either no changes at all, or symmetrically increased density in the thalami, corona radiata and, less often, posterior limb of the internal capsule, caudate nucleus, globus pallidus, and putamen. Sometimes more extensive hyperdense areas are noted, including the brain stem, cerebellum, dentate nucleus, optic radiation, central subcortical white matter, and cortical gray matter (Fig. 8.1). Pathologically, the hyperdensity on CT correlates with a higher concentration of globoid cells and proliferating glia. In stages II and III, symmetrical low-density areas in the periventricular white matter and corpus medullare of the cerebellum become obvious. The low density of the white matter is relatively less marked than in other leukodystrophies. The low density represents demyelination and increased water content. The severe fibrous astrogliosis that occurs in GLD may be responsible for the less intense hypodensity. In stage III diffuse brain atrophy, both central and peripheral, is observed. Sulci are widened, the head of the caudate nuclei is flattened, and the ventricles, including the third, are widened as a result of atrophy of the thalamus. MRI confirms the presence of periventricular white matter abnormalities with relative sparing of the U fibers in early-onset GLD (Fig. 8.2). The corpus callosum is affected, connecting the lesions of both sides. A radiating pattern with stripes of more normal signal intensity is often observed within the cerebral white matter (Fig. 8.2), but this pattern is not obligatory. The stripes correlate with perivascular deposits of globoid cells in microscopic examination of the brain. The posterior limb of the internal capsule, cere-bellar white matter, hilus of the dentate nucleus, and pyramidal tracts in the brain stem are involved (Fig. 8.2). In fact, involvement of the brain stem and cerebellum occurs early, before supratentorial white matter involvement. MRI can be deceptively normal in the initial stages of early-infantile GLD, which is probably largely related to the still immature myeli-nation preventing recognition of the presence and extent of white matter abnormalities. Signal abnormalities in the hilus of the dentate nucleus, cerebellar hemispheric white matter, and pyramidal tracts of the brain stem in infants only a few months of age should suggest the possibility of GLD. The areas of high density on CT may not be so clearly abnormal on MRI. These areas may have a relatively low or high signal intensity on T2-weighted images and a normal, high, or low signal intensity on Tj-weighted images. With progression of the disease, the subcortical white matter also becomes involved and global atrophy ensues. An unusual finding reported in a few GLD infants is optic nerve enlargement. This is related to the presence of a very high number of globoid cells. In many patients MRI and CT provide complementary information, CT showing the characteristic hyper-densities and MRI showing the extent of the demyeli-nation. In cases of late-onset GLD, hyperdensities in the thalamus and basal ganglia have been found on CT. 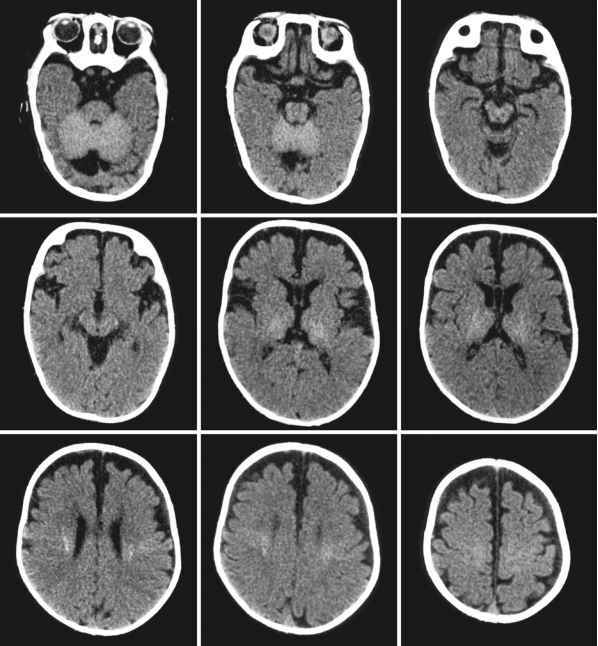 There are white matter abnormalities, and these may in part have a high density on CT. Both CT and MRI show a predominant involvement of the parieto-oc-cipital periventricular white matter with extensions in the temporal direction and associated involvement of the splenium of the corpus callosum (Fig. 8.3). 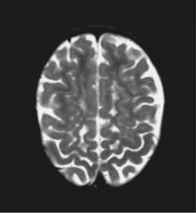 MRI may show a pattern of radiating stripes of more nearly normal signal intensity within the abnormal cerebral white matter. The U fibers are relatively spared (Fig. 8.3). The posterior limb of the internal capsule and pyramidal tracts in the brain stem are involved. The cerebellar white matter is spared. More extensive white matter lesions affecting the whole centrum semiovale probably represent a more advanced stage of disease. In the later stages atrophy becomes obvious. Furthermore, adults may exhibit signal changes restricted to the corticospinal tracts, extending from the motor cortex through the posterior limb of the internal capsule into the pyramidal tracts of the brain stem, in either a symmetrical or an asymmetrical or unilateral distribution (Fig. 8.4). However, some adult patients have a normal brain MRI for a long time. Some adults present with signs of an isolated poly-neuropathy. If they exhibit white matter abnormalities on cerebral MRI as described above, this should lead to inclusion of GLD in the differential diagnosis. Variable,but at most subtle,enhancement has been described in GLD cases and may involve the normal-abnormal white matter junction at the border between the deep white matter and the U fibers, and also the corpus callosum, cranial nerves, and spinal nerve roots. However, in most cases no enhancement is seen. Which leukodystrophies spare u fibes?